Skinny Chocolate Chip Cookies are out of this world. These are probably the best skinny cookies ever! 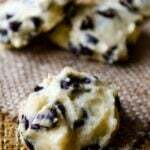 If you can’t live without chocolate chip cookies but need to watch your weight, make these! Your chocolate chip cookie craving will definitely be satisfied. And knowing that these are not loaded with calories, you don’t need to feel guilty. What makes these yummy cookies skinny? There is no oil or butter in these! I used unsweetened applesauce and a little peanut butter as a substitution. And these are low in sugar too. The result is amazing! Our readers already loved our Chocolate Chip Yogurt Cookies and Chocolate Fudge Yogurt Cookies. But we received several emails asking for even healthier cookies that are vegan friendly. 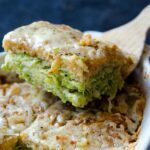 I’ve made some search, found this recipe on Lindsay’s Veggie Balance amd immediately tried it. What I understand with the first bite is that skinny doesn’t have to be freakish. These Skinny Chocolate Chip Cookies still have sugar, but not much and not refined white one. I used brown sugar. Lindsay even suggests using honey instead if you aren’t strict vegan. I’m not an expert on vegan recipes, but I guess chocolate chips inside these cookies are probably no good for vegans. She shares a link for vegan mini chocolate chips, so go check her recipe out if you have a vegan diet. I used all-purpose flour for these Skinny Chocolate Chip Cookies, but you can use whole wheat flour to take it to a next level of healthiness. I will try it that way next time. Also, I’m planning to try freezing some to see how it goes. If you freeze earlier than me, I’d be happy to see your result in the comments section. Please share your experience there. Chocolate chip cookies with low calories. No oil or butter in these. Applesauce is used instead. Preheat oven to 350F (175C). Line a baking sheet with parchment paper and set aside. Whisk together the flour, baking powder, salt, vanilla extract and sugar in a bowl. Add in the peanut butter and applesauce. Stir until combined well. Finally fold in the chocolate chips. Refrigerate it for 1 hour. Use two tablespoons and drop cookie balls on the baking sheet. These cookies look so thick and delicious! I was just wondering how to incorporate some peanut butter into chocolate chip cookies and found your recipe and blog. Great pictures! Pinning! Zerrin, beautiful recipe. Love those airy, fluffy cookies that are also low on fat. And thanks for the mentioning my recipe too! Drool. These cookies look AMAZING!!! Thanks for including a link to mine, too! Pinned, friend!